Inspect upper receiver (3) finish for scratches or worn shiny spots. If scratched or worn shiny in spots, disassemble and remove all lubricant from surface with dry cleaning solvent (item 15, app D). Wear rubber gloves (item 16, app D) and use a wash pan (item 22, app D) to apply solvent. Let parts dry thoroughly. Roughen the surface using abrasive cloth (item 12, app D) and apply solid film lubricant (item 19, app D). Allow 16 to 24 hours to dry before handling. Hold barrel (2) at 40-degree angle (muzzle down). Pull charging handle (8) to rear. Hold bolt carrier assembly (12) to rear and push charging handle forward. Release bolt carrier assembly (1 2). The bolt carrier assembly should close and lock under its own weight. 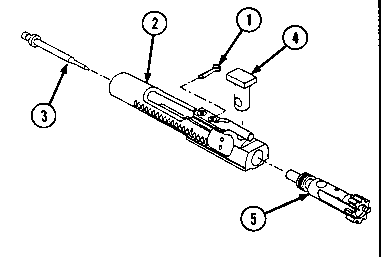 If it does not, remove the bolt (13) from the carrier(14) and slide the carrier (14) (without bolt) back and forth in the upper receiver and barrel assembly. If the gas tube (4) hits •the carrier key (15) or if the gas tube binds on the carrier key, try to correct the malfunction by adjusting (slightly bending) the gas tube in the area of the handguards. SH - If scratched or worn, to allow a shiny, light reflecting surface, apply solid film lubricant. D - If this does not correct the malfunction, evacuate to direct support maintenance.